Oppo has announced the launch of its latest flagship smartphone – the N1 – the first handset to officially run CyanogenMod. Powered by the 1.7GHz Snapdragon 600 quad-core processor, the N1 packs a 5.9-inch full HD 1080p display, a generous 3610mAh battery and a touch panel on the rear that will allow users to scroll and take photos. The 13-megapixel camera onboard the N1 comes with an f/2.0, 6-element lens plus dual LED and is rotatable over 206 degrees – giving selfie-obsessed users a lot more to play with. Assuring users of the durability of the camera assembly, Oppo claims that imager has been subjected to stress testing of over 100,000 uses. The N1 comes with an aluminum alloy frame enclosure with a ceramic-like body that has been specifically designed to minimize fingerprints. Some of the other features of the N1 are an Adreno 320 GPU, 2GB of RAM, 16 or 32GB of internal storage, Bluetooth 4.0, Wi-Fi 802.11ac, Wi-Fi Direct, GPS, Distance sensor, Light sensor, G-sensor, and 4D Gyroscope. The smartphone also comes with an updated version of Oppo’s beautification algorithm as well as support for video beautification in messaging apps like QQ. The N1 runs a highly customized version of Android 4.2 dubbed Color and Oppo is also providing a choice of flashing CyanogenMod from the stock recovery. The company has also revealed that it will be shipping a limited number of devices that will have CyanogenMod pre-installed. CyanogenMod formed a company last week and is no longer just another Android based custom ROM that is used by Android enthusiasts across the globe. 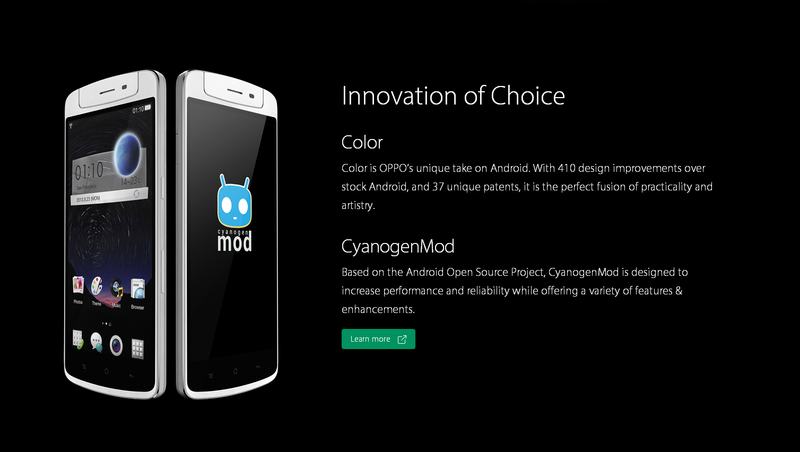 CyanogenMod is now a software package that will be distributed officially on handsets through vendor partnerships and Oppo is evidently the first one to have partnered with CyanogenMod. Previous articleShould I buy a Tesco Hudl Tablet?